Training Plans for Cyclists offers cycling enthusiasts and beginning cyclists an easy-to-use way to prepare for their biggest and best rides. Anyone looking to enjoy longer rides or participate in centuries, multiday tours, even mountain bike races, can count on Training Plans for Cyclists to help reach their goals. World-class cycling coach Gale Bernhardt provides 16 high-quality training plans to prepare riders for the most popular rides cycling has to offer. With Training Plans for Cyclists, road cyclists can tune up for 30-mile rides, metric centuries, century rides, 3-day and 1-week tours, or enjoy building base fitness with a structured plan. Mountain bikers can get in shape for longer weekend rides or prepare for 100-mile and 24-hour races. Long-known for her user-friendly plans, Bernhardt puts training in plain English. She explains how training works, how hard each workout should be, how to fuel, and how to ensure comfortable riding. Bernhardt states each plan's goal and profiles the rider it's designed for. Each training program includes easy guidelines to help cyclists meet their goals even while accommodating busy schedules. 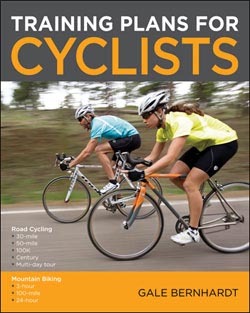 With over 60 workout descriptions, stretching exercises, and guides for handling common injuries and illnesses, Training Plans for Cyclists is an affordable, complete resource for anyone who wants to get more enjoyment out of cycling. Paperback with tables and charts throughout. Gale Bernhardt has coached and instructed athletes since 1974. An elite-certified USA Cycling Level I Coach, she has also served as the Chairperson of the USA Triathlon National Coaching Committee for five years. Bernhardt was selected to be the USA Triathlon team coach at the 2004 Olympic Games and has traveled the world as a USA Triathlon World Cup coach. Bernhardt is the bestselling author of Bicycling for Women, Training Plans for Multisport Athletes, Triathlon Training Basics, and Workouts in a Binder(r): Swim Workouts for Triathletes. VeloPress is an endurance sports and fitness publisher focused on cycling, triathlon, and running. VeloPress is the book publishing division of Competitor Group, Inc., publisher of VeloNews, Triathlete, Inside Triathlon, and Competitor magazines and producer of the Rock 'N' Roll marathon and half-marathon series and the Muddy Buddy adventure series.